HIGH ACHIEVER: Annie Curtis, winner of the 2016 Louise Perkins Prize, is pictured with Scott Perkins and Louise’s parents, Terry Mikkelsen and Marion Mikkelsen. Photo supplied. Congratulations to University of Auckland student Annie Curtis who has been awarded the Louise Perkins Prize in Art History. The prize was established in 2005 to commemorate former Art History student Louise Perkins, who excelled in the field but passed away after a long fight with cancer. The prize is awarded to the graduating Art History major who earned the highest grades throughout his or her degree. 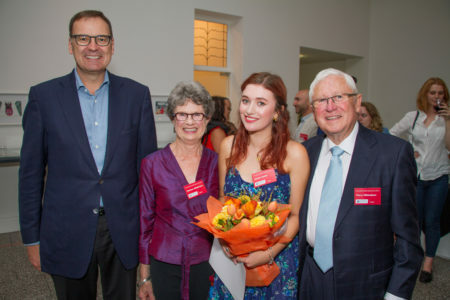 Cockle Bay resident Annie, who completed her Bachelor of Arts degree with Honours in Art History, was honoured as the 2016 recipient of the award at a special ceremony on March 27.